The Verbatim Store 'n' Go Ultra Slim Portable Hard Drive with USB 3.0 is a decent product for easily carrying around large amounts of data. While on the outside it looks slim, the unit we tested held a hefty 500GB capacity, making the drive an excellent choice for photos, music and films. The drive's casing is so thin and light that it can easily fit in a pocket, or be carried around in a laptop or tablet bag. It's a great way of expanding a laptop or tablet's capacity, since you'll hardly notice you're carrying it around with you. The downside of such a thin case is that it offers very little protection from knocks and bumps, and the case itself feels rather plastic and brittle. This isn't a hard drive that you could drop, unlike the ioSafe Rugged Portable Hard Drive. However, external hard drives of this capacity don't come much more portable. Verbatim has included software on the disk that adds some value to the hard drive. Nero BackItUp is a decent piece of software for backing up your files, though it's not usually our first choice of backup software. A program designed to reduce the power consumption of the drive and software that makes formatting the drive easy are also included. Extra software is always nice to see, but neither are particularly useful. The Verbatim Store 'n' Go Ultra Slim Portable Hard Drive has a USB 3.0 interface, so we were expecting fast results in our tests. Our benchmarks recorded a 79.07 MB/s average write speed, along with a 105.56 MB/s read speed, which are very good, though not the fastest speeds we've seen. We were able to copy over a 1.36GB test file in just 22 seconds. 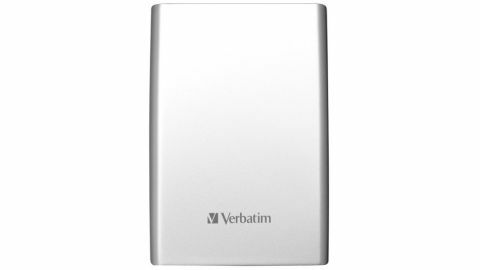 Overall the Verbatim Store 'n' Go Ultra Slim Portable Hard Drive is an excellent portable hard drive, which is small and light enough to carry around, but with a capacity and transfer speeds that really makes this hard drive worth buying. Our only reservation is the flimsy casing, which is a trade-off for such a small size and weight.